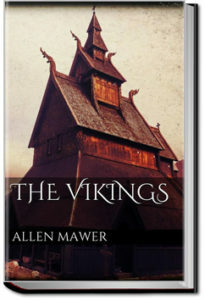 This is a concise history of the Vikings by Allen Mawer, MA, Professor of English Language and Literature in Armstrong College, University of Durham: late Fellow of Gonville and Caius College, Cambridge. It includes the following chapters: I.Causes of the Viking movement; II.The Viking movement down to the middle of the 9th century; III.The Vikings in England to the death of Harthacnut ; IV.The Vikings in the Frankish Empire to the founding of Normandy (911);V. The Vikings in Ireland to the battle of Clontarf (1014); VI.The Vikings in the Orkneys, Scotland, the Western Islands and Man; VII.The Vikings in Baltic lands and Russia; VIII.Viking civilisation; IX. Scandinavian influence in the Orkneys, Shetlands, the Western Islands and Man; X. Scandinavian influence in Ireland ; XI. Scandinavian influence in England; and XII. Scandinavian influence in the Empire and Iceland.